(Niagara Falls, ON) September 6 – The Ontario Power Generation (OPG) 36th Annual Winter Festival of Lights (WFOL) in Niagara Falls kicks off early this year beginning November 3 and running through to January 31, 2019. Opening Ceremonies for the festival will take place at Niagara Parks’ Queen Victoria Park on Saturday, November 3, 2018, and will feature fun for the whole family. The public is invited to attend the free events. “Our goal is to create an experience that everybody will fondly remember,” said Myers. “While you are there, be sure to check out Impulse, a publicly activated light and sound experience that features a series of interactive illuminated see-saws that transform when put into motion by people. Impulse will be located in Queen Victoria Park until December 1,” added Myers. As one of North America’s premier illumination festivals and recipient of the prestigious Attractions Ontario, Ontario’s Choice Award for Top Festival and Event, the Ontario Power Generation Winter Festival of Lights is attended by over 1.5 million visitors each year. The festival transforms Niagara Falls into a winter wonderland with millions of sparkling lights and breathtaking illuminations. 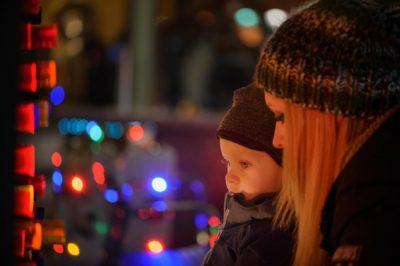 A trip to see the lights in Niagara Falls is a festive tradition for people of all ages. The Ontario Power Generation Winter Festival of Lights has become famous for its many iconic illuminated displays including the Zimmerman Fountain and Skylon Tower, the light show on the century-old Toronto Power Generating Station, Noah’s Ark plus the many Canadian themed displays and trees wrapped in thousands of lights in the Dufferin Islands nature area, just to name a few. OPG generates safe, clean, reliable, low-cost power for Ontario. More than 99 percent of this power is free of smog and carbon emissions. OPG’s power is priced 40 percent lower than other generators, which helps moderate customer bills. The historic Sir Adam Beck Hydro Generating Stations on the Niagara River have been powering the province for almost a century.